Grass is a fun material that can be used in many ways. If you are familiar with a Chia Pet, then you can use a few household materials to make something similar. You can easily get grass seed to grow on any suitable material with a little effort. 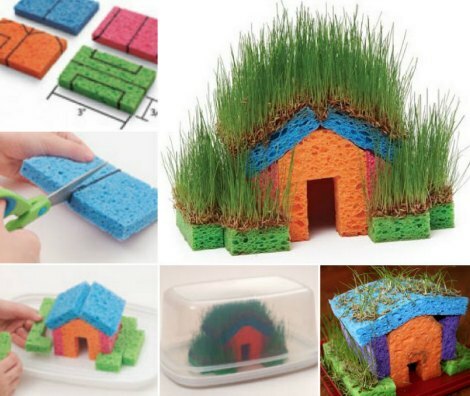 This includes common kitchen sponges to create a grass house. Kitchen sponges come in many types and can easily be used to make a grass house. The best product will be one that does not have a scratch pad. A pair of scissors or a knife can be used to cut sponges into various pieces to use for a grass house. The use of a ruler may be necessary if you want to measure the size to cut the sponges. The pieces simply need to be stacked into the shape of for your house. The most important detail about a grass house is watering the seeds. This is done with a spray bottle as you can add some plant food or fertilizer. A plastic tub or small container needs to be used to ensure the grass is protected and will sprout. All you need to do is water the grass regularly after it starts to grow.